Nature inspires me , it inspires you and I bet it inspires children more than anything, even an I-Pad. So that day we thought of Collecting natural stuff in our garden . One of them was excited at the cemented piece and he clearly told me ,"Miss Erum, its not a Rock, I know,whats that? "..I was simply amazed, how kids learn everything similarities, differences, textures, qualities by interacting with nature ; paper work is just a nonsense Burden at this stage. One of the girl collected medium - sized Rocks ,and she loved them. I told them to get some small leafs with straight ends and they got the right stuff, thanks to the Montessori system , where children learn about the BOTANY Cabinet when they are just 3 and can easily relate it to real leaves around them. She was so immersed in her collection ,that she forgot that she had to return to her class, sometimes I feel CLASSROOMS are useless. This is the leaf they have already observed in their BOTANY CABINET in the Culture area of our Montessori class. Collecting dry grass was as exciting as it can be for a child. After each group of children collected things from the garden ,they themselves put their buckets in a line and told me that they have collected six different items ,one of them was pebbles. Another group collected dry grass and few dried flowers. Middle sized rocks was collected by a group of three children. Every time a group came to me with their buckets,I was amazed to witness the uniformity of Size and Structure. Amazing scientific methods used by children ! A group of girls collected green leaves from the ground. After the collection of all the Garden materials, we gathered around and then I asked each group about what they brought. Happy and excited even after an hour of continuous Nature-hunting . Here's the rest of my class. He was putting the stuff in his plastic bag. Getting his share of nature sorting. I was really surprised to witness that not a single child grab more than one stuff from each bucket, as against the adult's wrong perception that children are greedy when they are given free choice . Concentration can never be so deep as can be seen in a Natural environment where children learn by Discovery without any INSTRUCTION . And finally its time to take their packs of Garden Collection home . We could see that how simple Garden sorting activity develop fine-motor skills, Mathematical mind, reasoning, critical thinking, and new vocabulary. What I have learned from these simple Nature - based activities that we as an Educationists doesn't need to do much , we just need to prepare the environment, and the learning will take place on it's own..
My children decided to bring out the musical instruments and all kinds of stuff from our Sound Box with their teddies..so that they can enjoy music too. It was our another amazing day of CARDBORAD CREATIVITY , and we decided to make our own SMACK THE PUPPET BOX, so i handed over the cardboard to my children and they started cutting and cutting and cutting ,they love cutting the circles ,i dont need to teach them about the circles everyday by showing pictures, they actually do it evereyday with their hands. Concentration of children is the big problem now as complained by educationists , teachers, parents ,and everyone ,but what i'v discovered is just simply opposite , children display the uniaginable concentration when work in nature or when working with their hands with real stuffs, so its proved autoatically that the FLAW is not in children but the CURRENT TRADITIONAL EDUCATION SYSTEM OF THE WORLD. And now the SMACK THE PUPPET box was ready to play. Waiting for the puppet stick to appear , getting the concept of Time calculation, estimation and stimulus-response connections....kids learn best when they PLAY...not by Sitting idly in classrooms. Little ones displyed excellent sense of patience which can only be possible when they are given opportunities to play in nature . CHILDREN are amazing creatures ,they learn while they never know they are learning..so any curriculum which is making them well awared of their learning process is thus entirely a FLOP SYSTEM. 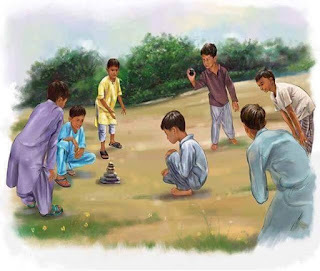 And children kept coming to play the game, not a single child shouted for his turn, i know they are all naturally well managed.,its just a matter of our environment which is actually aking them IMPATIENT.